News just in from Marc Haendle at Ocean Independence in Palma of a further €170,000 price drop on his listing for sale, the 23.5 metre motor yacht Pure Pleasure. Built by Italian yard Pershing to a design by Fulvio di Simone and delivered in 2003 as a Pershing 76 model, * Pure Pleasure* is all about high performance. 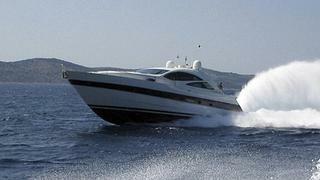 Under the same ownership since delivery, Pure Pleasure has always been a private yacht and never chartered. Accommodation is for eight guests in a master suite, VIP stateroom and two guest cabins and all have en suite bathroom facilities. Alfresco entertaining and dining are available on her aft deck with steps on the port side leading down to a large swim platform. Powered by twin 2,000hp MTU engines linked to Arneson surface drives and with a deep V hull, she cruises at 38 knots, topping out at 48 knots – pure pleasure indeed. Lying in Sardinia, Italy, Pure Pleasure is down from €1.15 million to €980,000.